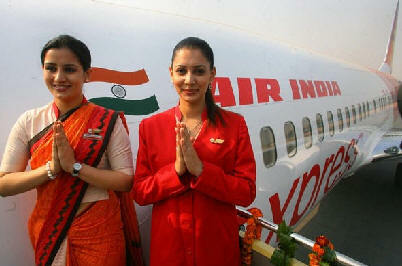 September 29, 2009, Air India’s operations continued to be impacted on the fourth day of a sick out by Air India Pilots. Fourteen international flights out of 29 have to be cancelled as a result of 72 Pilots reported sick since yesterday. The flights affected were Nonstop flights to New York from Delhi and Mumbai; flights to London from Delhi and Mumbai; flights to Chicago from Delhi and flights to Singapore from Mumbai. The other flights affected included the Amritsar-London-Toronto and Ahmedabad-Frankfurt. On the domestic front, Air India will be operating 101 out of 197 scheduled flights today. 77 flights will be cancelled due to non availability of pilots who have been reporting sick since September 26, 2009. So far, 116 Pilots of NACIL have reported sick thus forcing Air India to curtail its flight schedule. Meanwhile, Air India is keeping its channels of communication with pilots open so that those wishing to have their concerns addressed can do so. Chairman and Managing Director, Arvind Jadhav had appealed to the pilots yesterday to restore normalcy at the earliest as cancellation of flights was inconveniencing passengers and harming the airline’s interests. Yesterday the meeting between Air India Chairman and Managing Director, Mr Arvind Jadhav, and NACIL pilots in Delhi ended in a stalemate with the pilots not accepting pay cuts. Air India pilots, who had so far been operating the flights as per their normal schedules began reporting sick from late evening affecting operation of flights to west-bound destinations later in the evening. Passengers of the affected services were being transferred to other airlines. A team of Air India officials has been posted at airports to ensure that passengers are not inconvenienced. Air India Management is deliberating various options in the wake of more pilots reporting sick affecting its operations. Air India Management decided to reprimand pilots who had reported sick in the past three days affecting flights. Air India financial crisis began around 2006-07, the airlines began showing signs of financial distress. The combined losses for Air India and Indian Airlines in 2006-07 were Rs 7.7 billion. After the merger of the airlines, this went up to Rs 72 billion by March 2009. This was followed by restructuring plans which are still in progress. In July 2009, SBI Capital Markets Ltd was appointed to prepare a road map for the recovery of the airline. The carrier cancelled the purchase of six Boeing 777-300ER in July 2009 and sold three Airbus A300 and one Boeing 747-300M in March 2009 for $18.75 million to survive the financial crunch.